Tiaon, Quezon—Batch 180 of SM Foundation’s Kabalikat sa Kabuhayan recently held their Harvest Festival in Brgy. Ayusan 1 here. The KSK trainees proudly presented their harvests to Tiaong Mayor Ramon Preza, who graced the occasion and encouraged them to share what the learned to the other farmers. 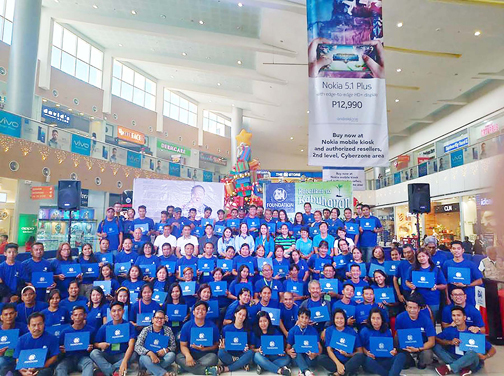 The sentiment was shared by SM City San Pablo Assistant Mall Manager Daniel Felix Belen who attended the harvest festival with officials from SaveMore Tiaong, and SM Supermarket San Pablo. Department of Agriculture Chief of Staff Ms. Zenaida Amargo, MSWDO Head Ms. Rosette, DSWD SLP Ms. Mary Grace Escala, Harbest Agribusiness, Brgy Captain of Ayusan 1, David Ramos and Brgy Council were also around to give their support. SM City San Pablo hosted the graduation ceremony for the 104 graduates. KSK 2014 graduate Magdalena “Mags” Repaz shared her experiences as a former KSK participant and encouraged the graduates to become entrepreneurs or suppliers, aiming beyond merely providing food foe their families. “Sana ma-realize ng mga farmers na tayo ay hindi sa bukid lang, na there is a world outside. At yung world outside na yun, iyung marketing,” Repaz said. Since SM Foundation institutionalized the KSK Farmers Training Program, it has expanded to include farming in the urban areas. It also afforded graduates to become entrepreneurs. From teaching them modern farming techniques, they are provided social entrepreneurial courses, market linkages and assistance in forming associations and cooperatives.